In 2-quart saucepan, mix water, coconut milk, 1/2 teaspoon of the cinnamon and the salt. Heat to boiling over medium-high heat. Stir in oats; reduce heat to low. Simmer uncovered 30 to 35 minutes, stirring occasionally, until oats are tender yet slightly chewy. Remove from heat. Stir in honey. 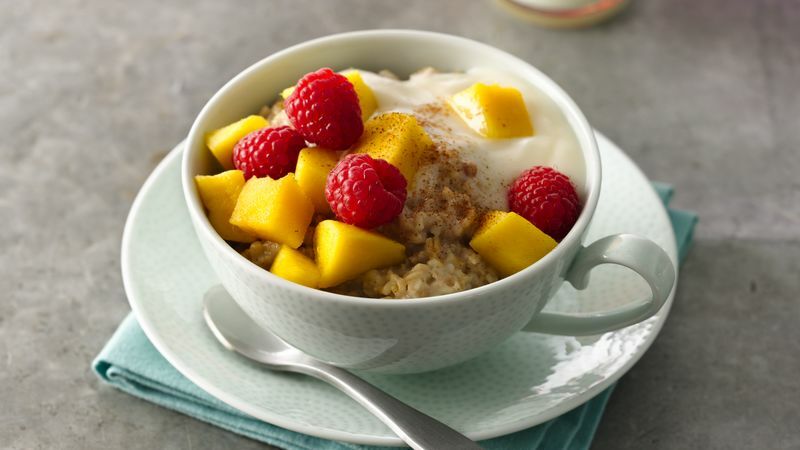 Divide oats among 4 bowls; top each with generous 2 tablespoons yogurt, about 1/3 cup mango and 1/4 cup raspberries. Sprinkle evenly with remaining 1/4 teaspoon cinnamon. Serve yourself a smaller portion by turning this recipe into 6 servings instead of 4; each smaller serving will provide 220 calories.